Almaty (the old capital of the Rep. of Kazakstan ) based small documentary film and video productions created by Korean film-maker and writer Lavrenty Dedyunovitch SONG. In 1989, when in former Soviet Union appeared the possibility to organize free productions without governmental control and censor, L.D. SONG created a creative union of writers, film-makers and researchers called TUI I YA (in Russian means YOU and ME) under the umbrella of the Writers Union of the Rep. of Kazakstan and he intensively produced documentaries on repressed citizens of the USSR and non- Russian minorities. Although those films are very important evidence of the free pictures of the end of the Perestroika period, however commercially not successful. In 1992, when the Republic of Kazakstan got complete independence, Lavrenty SONG re-organized TUI I YA and created his own family productions Song Cinema Inc. He changed method of his works and using small video equipment for unique author film style. He is also coordinating documentary film productions in Kazakstan for foreign TV productions from Japan, Germany, etc. Now major his works are available through TokyoCinema in NTSC VHS for preview and purchase. He was born as a son of the Koreans who deported not by own will from Russian Far East to Kazakstan and the Central Asia, at the small collective farm near the town of USHTOBE, Taldui-Kurgan Oblast', Rep. of Kazakstan. After engagement several profession, he entered VGIK (All Union State Institute of Cinematography) in Moscow and studied at the course for scenarios. Here he met OKADA Kazuo who studied at the directors course and he assisted Kazuo's first practice film making. He graduated the diploma of scenarios at VGIK and started professional works at Kazak Film Studios in Alma-Ata as a scenarist for future films. He started filming also as a film-director. He entered both the Film Makers Union of the USSR as well as the Writers Union of the USSR. He was forced to resign the post at Kazak Film Studios due to his liberal opinions. He became a director and drama-writer at The Republican State Korean Theatre in Alma-Ata, only Korean theatre in the USSR after 1937 deportation. Russian general monthly journal PROSTOR in Alma-Ata published his auto-biographic novel THE PLAZA OF TRIANGLES, the first ever published literature touched on Korean deportation in 1937. Moscow based famous weekly journal AGANYOK mentioned THE PLAZA OF TRIANGLES and gave high points. He edited the first ever anthology of the Soviet Korean Writers written in Russian FROM THE PAGES OF LUNAR CALENDAR and published fro the SOVIET WRITERS PRESS in Moscow. From his own work, he included THE PLAZA of TRIANGLES. He started independent film studio TUI I YA under the Kazakstan Union of Writers and produced various documentaries on repressed citizens and minorities in Soviet Empire. He participated the 3rd Paernu International Visual Anthropology Festival in Estonia and there met OKADA Kazuo after 23 years no connections. He established Song Cinema as a succeeding company of Tui i Ya. He invited and made lecture tour in Germany and also in Japan. He made a lecture about the temporally situation of Koreans in former Soviet Union at the 30 years anniversary international symposium of the Shimonaka Memorial foundation organized by OKADA Kazuo in Tokyo. 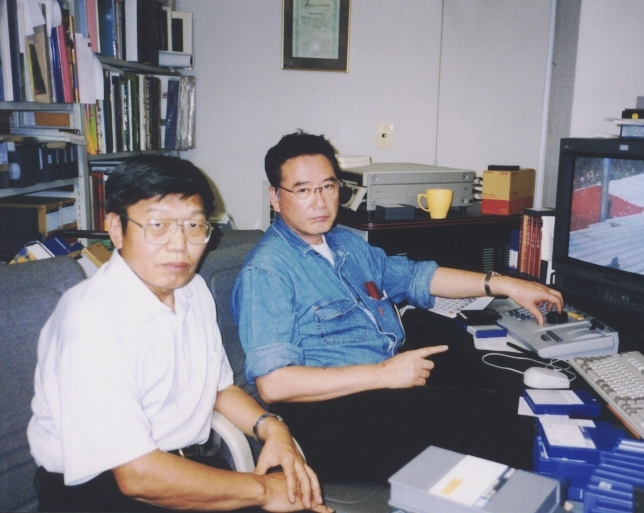 His talk with Japanese Korean writer LI Feng-Song was televised at GENDAI JOURNAL of the educational channel of NHK and introduced his documentary activities.In Tokyo he obtained high-end Video High-8 camcorders and editing equipment and started documentary video productions on the society of Koreans in the Central Asia. He organized an International seminar KOREAN DIASPORA and ETHNIC SYMBION in Almaty and visited Japan again and gave several lectures in Tokyo, Kawasaki, Osaka and Kawaguchi. He coordinated several natural history programs for NHK's THE GLOBAL FAMILY and ETV Special REVIVAL OF THE ETHNIC MUSICS. He was appointed as the General Artistic Manager of the State Korean Theatre from the Ministry of Culture. He appointed the General Producer for the 60 Years Anniversary of the Korean Deportation to the Kazakstan. He wrote and staged the commemorate play THE MEMORY. He directed and wrote the script of the official documentary film of the presentation of the transfer of the capital of the Kazakstan from Almaty to Astana. He directed a documentary THE TEACHER OF MUSIC and visited Tokyo for post production of his documentary THE PRINCIPAL. He gave lectures at University Wakoh, Tokyo University and Hokkaido University Slavic Study Center. He coordinated shooting of NHK　ETV-SPECIAL on Koreans in Central Asia and their return to Russian Far-North. He coordinated DISCOVER THE ASIA for NHK Fukuoka. A very unique video interview of Russian, Ukrainian, Kazak, Chechen and Kurd who speak Koreans even better than Koreans themselves who lives in the city. A video essay of old Korean, KAN TeS a writer who lonely lives in Kuzil Orda the bank of Sil-Daria Riverr. A document of musical group mainly organized Korean children. The commemorative video of a Jewish musician Ilia TEITERBAUM who taught music to Korean kids in the Bolshevik Korean Collective Farm nearby Tashkent, Uzbekistan and his life after his liberation. How he worked in Minsk and died. English Narrated version is available. In Moscow, March 1991, the first and the last time, the nation wide organization of Soviet Koreans was held their presentation meeting. A report of Vadur or Yukagir of Siberian Far-North, only remain several hundreds souls. The Nivkh people in Sakhalin island is now in extinction. Film reports how those people think themselves on this situation. The situation of Soviet Germans in Perestroika Period. How they repressed in the heaven of working class and internationalism. A beautiful story of Russian Old Believers live in Altai mountains of the east Kazakstan. A movie essay of a Swedish old man who deported to the lake shores of Balkhash and not returned home after his liberation. THE TURKISH WEDDING Meskhetian Turks who were deported from Georgia to the Central Asia was a victim of Ethnic trouble in Fergana, Uzbekistan. Here intercuts the happy wedding rituals traditionally held in Turkish community and ethnic troubles and several interview how meskhetians feeling about themselves.